WASHINGTON: Donald Trump´s spokeswoman Sarah Sanders defended the president Sunday against accusations that he was inciting violence toward a Muslim congresswoman after he tweeted a video of her spliced with footage of the 9/11 attacks. The White House's decision to double down on Ilhan Omar came as House Speaker Nancy Pelosi, the country´s most powerful Democrat, said she had spoken to authorities about her colleague´s safety and urged Trump to delete the clip. 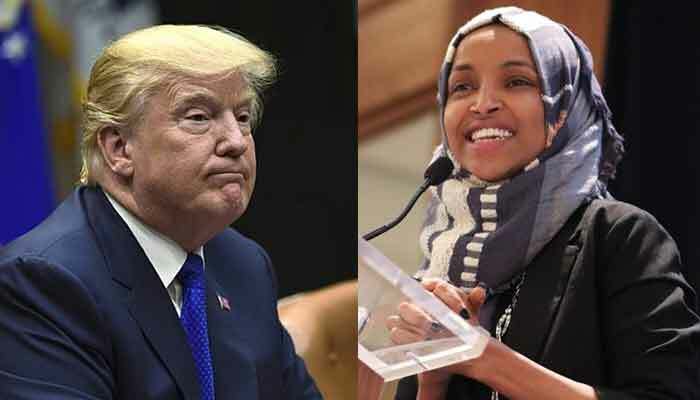 On Friday, Trump tweeted a video that juxtaposed the snippet, which Omar´s fellow Democrats say was taken out of context, with images of the hijacked planes used in the attacks crashing into the Twin Towers that once dominated New York´s skyline. Menacing music accompanies Omar´s words. Prominent Democrats including Beto O´Rourke, Kamala Harris and Omar´s fellow first-time Congresswoman Alexandria Ocasio-Cortez were quick to rush to Omar´s defense, accusing the president and other Republicans of deliberately de-contextualizing her remarks and endangering her life. Sanders, however, defended Trump, telling ABC television´s "This Week" that "the president is wishing no ill will and certainly not violence towards anyone." But, she added: "It´s absolutely abhorrent the comments she continues to make and has made and (Democrats) look the other way. "I find her comments to be absolutely disgraceful and unbefitting of a member of Congress and I think that it´s a good thing that the president is calling her out for those comments, and the big question is why aren´t Democrats doing it as well." Pelosi took time out from an official trip to issue a strong statement urging Trump to take the clip down. "Following the president´s tweet, I spoke with the sergeant-at-arms to ensure that Capitol Police are conducting a security assessment to safeguard Congresswoman Omar, her family and her staff," she said. "The president´s words weigh a ton, and his hateful and inflammatory rhetoric creates real danger. President Trump must take down his disrespectful and dangerous video." "For far too long, we have lived with the discomfort of being a second-class citizen and, frankly, I´m tired of it, and every single Muslim in this country should be tired of it," she said. The speech did not initially receive significant attention until the snippet in question was highlighted weeks later by Australian personality Mohammad Tawhidi who refers to himself as the "Imam of Peace."